The automation and efficiency that software can bring will have a great impact on the development of Industry 4.0. 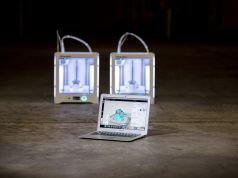 The new updates in the Materialise Magics 3D Print Suite, including Magics 22 and Inspector 3, will be showcased at formnext and support the growth of the AM industry by contributing to a stronger ecosystem of products and a stronger connection to traditional platform systems. The full software suite will be on display during formnext at booth C48 in hall 3. The announcement of a new Magics version has become a formnext classic. 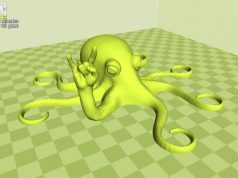 As the AM data preparation software reference for every material, Materialise Magics22 addresses tough challenges in professional 3D Printing with its improved workflow and design optimization tools, leading to an increase in speed and a reduction of material consumption. 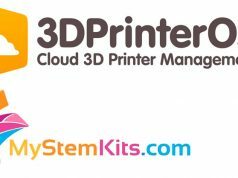 The new version allows the user to generate metal support structure faster, create denser Laser Sintering platforms, and fit more parts on Stereolithography, DLP and FDM platforms. 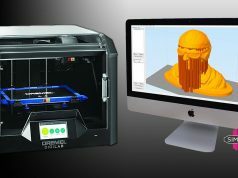 Whatever technology the user favors, Materialise Magics is present to support the 3D printing workflow. “Smoothness in the data prep workflow has been mentioned by beta testers as one of the biggest benefits of this new version. Improvements include: part list, build time estimation, perforation and label tools, to name just a few. 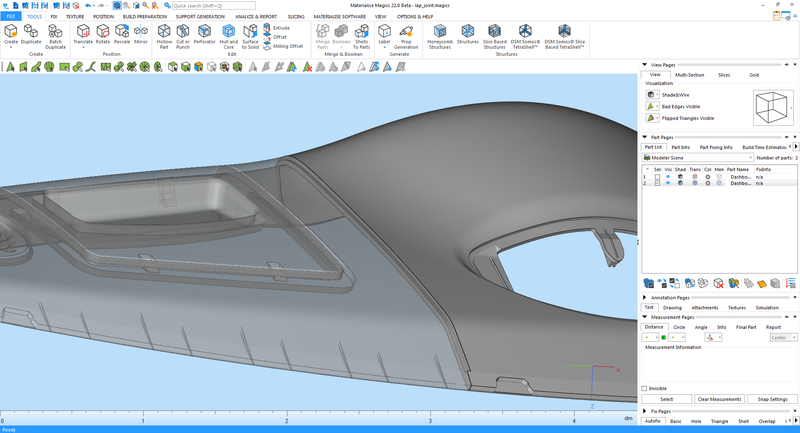 Time-saving enhancements in the Sinter Module resulted in a speed increase of 20% on 3D nesting and around half an hour per build on multiplatform nesting”, says Thomas Moens, Senior Product Director at Materialise. Magics 22 also includes new design features such as the honeycomb structure, which reduces weight without sacrificing strength, and the shelling feature which reduces material consumption without changing functional design. 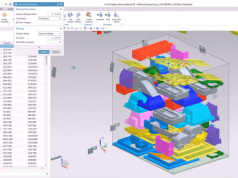 The upcoming Magics module that integrates simulation tools into the file preparation process will be presented as a proof of concept in demo sessions at formnext. This module provides the user with a thorough AM process understanding, improving efficiency and reducing the scrap rate generated during the AM process. 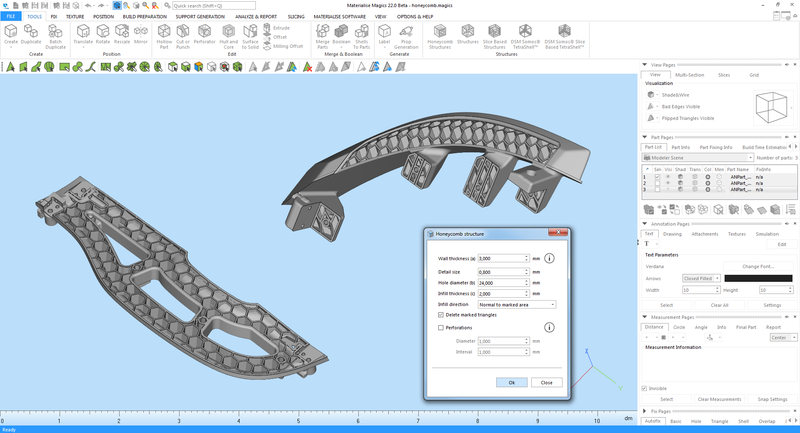 Materialise Inspector software helps define the best machine parameters, limits the number of iterations needed to print good parts and reduces the time and material spent. Moreover, it helps the user to prove that their production facility meets the required quality standards. The new version will allow for online error detection, which means that the software analyzes build images in real time and the machine operator can immediately stop the build if errors occur. The benefits of this software will be displayed at the booths of both Materialise and GE Sensing & Inspection Technologies. 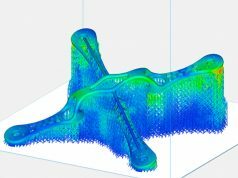 “The combined functionalities of Materialise’s inspection and simulation software for Metal AM provide the missing link to bring 3D Printing into manufacturing environments. 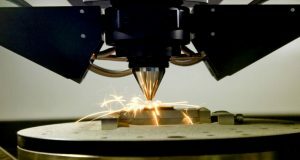 Once your parameters are tuned and validated, you can automatically validate the quality of your production parts throughout the different production stages”, says Tim van den Bogaert, Sr. Director New Business of Materialise. “Materialise is focusing on bringing automated science and physics-driven tools to help users run their production environment as reliably and efficiently as possible. Simulation will play an essential role in this”. In addition, the machine manufacturing business can benefit from remarkable improvements related to the Materialise Control Platform. This AM-specific control system, recently optimized for multi-optics machines, connects machines to 3D print software and enables fast market entry for new AM machines. Materialise has also started offering specialized consultancy for OEMs that request support on calibration, Lua scripting, and more. 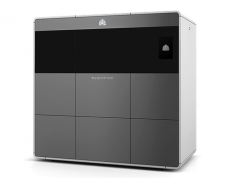 Another interesting solution for machine manufacturers is Materialise Magics Print Metal, which is a tailored version of Materialise Magics that provides basic build preparation and job file generation for users of metal printers. The full suite and new releases will be on display at formnext in Hall 3, booth C48. 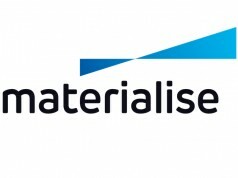 Members of the press are invited to attend Materialise’s press conference on Tuesday, November 14 at 13:30 to learn about the next innovation in software for Metal 3D Printing.